On 12th of November 2016, at Ogbete main market in Enugu, Biafra land, a notorious Hausa/Fulani man was caught after he stole a meat worth of over 22 pounds of weight at the market abattoir located at Akwata side. The information gathered by Family Writers has it that this Hausa/Fulani man has been doing this atrocious act for a long time with the aid of his charm which makes him invisible when performing his evil operations. However, as God may have it, one of the largest quantity of meat missed last week. The butchers in the area opened up massive investigations to know what has been behind the usual missing of meats in the market. The whole meat sellers then teamed up together for fasting and prayer which lasted for five days. However, after their prayers, the meat sellers (butchers) where convinced that the regular missing of their meat is not an ordinary or physical issue to tackle against, therefore they all teamed up to be vigilant both physically and spiritually. On Saturday 12th of November, 2016, around morning time, precisely at 8:30am, a period at which all the meat sellers have already set out their product for sale, a young man holding a sack-bag walked in majestically towards were some of the meats have been packed, and began to pack the bunch of meat without the consent of the sellers. 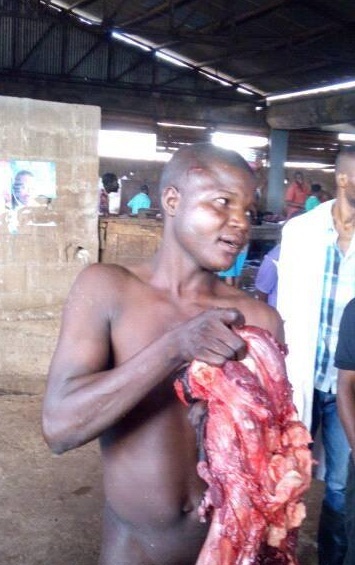 After loading the huge quantity of meat inside the bag he came with, and raised it on his head, he started moving away with the meat; but after about 12 feets ahead, one of the meat sellers called him back but the Hausa/Fulani man refused to answer, and the two started quarreling. This drew the attention of the audience to know what is happening. After several attempts to stop the Hausa/Fulani man, the crowd succeeded and asked him how he managed to have access to the huge meats he is carrying, but he couldn't gave any reasonable answer to the questions. Few minutes after he was caught, his clothes were collected from him, lo and behold, the crowd saw some African magical charms which he tied on his arm and leg, then they are force fully removed from his body to avoid his disappearance. Afterwards, he made confessions that he has been doing the stealing for a long period of time, and during all his operations he makes use of the charms so as to transform himself into an invisible being, as by so doing, he is able to evade being caught while he makes his money afterwards through his business by frying the stolen meat for sale, which is popularly called "Suyar meat" in Nigeria. And after the incident, he was handed over to police to take care of the case.